MUAR, 5 April 2014 – Some 158 members of The National University of Malaysia’s (UKM) Volunteer Police Force (Suksis) received honours from the Vice Chancellor Professor Datuk Dr Noor Azlan Ghazali after completing their marksmanship training at the Royal Malaysian Police Technical College, here today. Prof Noor Azlan praised Suksis members describing them as successfully achieving the Red Umbrella status for having stood out from the rest because of their achievements. The Vice Chancellor expressed the hope that the students will be unique and different from others and can impress the public. 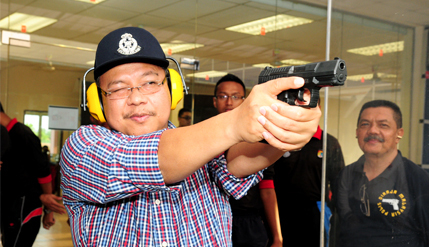 “The marksmanship training should make Suksis members aware of the importance of precision in their daily tasks. This experience is invaluable and Suksis members who take part will understand some of the necessities of the police service,” Prof Noor Azlan said. The three-day marksmanship exercise provided the opportunity for Suksis members to train with M16 rifles and side-arms. The shooting training is part of the Orientation Course for Suksis volunteers that include Marine training, First Aid, Ethics, Leadership and a programme of visits to various centres of the Royal Malaysian Police (PDRM) as well as the Federal Reserve Unit Training. Inspector Roslan bin Yunus a training officer on duty at UKM Sukses hq said Suksis members also needed to attend a basic course on Malaysian common law. He praised Suksis members for their high morale and enthusiasm. Undergraduates who join the team will be commissioned as a Suksis officer with a rank of Inspector on completion of their three year training stint while at the university. Those interested can continue service in the police force either as regular officers or reservists. Inspector Roslan hoped UKM alumni or its students who have completed their training would resume their service even when they sign up for postgraduate studies.